NEW YORK (AP) Scientists in central Africa say they have unearthed the oldest trace of a pre-human ancestor  a remarkably intact skull of a previously unknown species that walked upright as far back as 7 million years ago. In what may be the most startling fossil find in decades, the thick-browed, flat-faced specimen was discovered in Chad, 2,414 km west of earlier pre-human discoveries in east Africa. The skull's age, physical appearance and location challenge basic beliefs about the evolution of humankind's earliest ancestors. Scientists gave the skull the nickname, Toumai, or "hope of life" in Africa's Goran language. It was uncovered a year ago by a 40-person research team led by French paleontologists in a remote, wind-scoured stretch of desert dunes, but since was kept from public view. Details were to be published Thursday in the journal Nature. The researchers were to make their first public comments Wednesday in N'djamena, the capital of Chad. Other scientists who have examined the skull said it is a landmark but enigmatic specimen that raises more questions about humankind's presumed origins from the larger primate family. "It's not what we thought we would find," said Bernard Wood of George Washington University. "If you look at the back of it, it looks like a chimpanzee, and if you look at the front of it, it looks like something in the human fossil record unambiguously a couple of million years ago." While it raises "a wheelbarrow full of questions," Harvard anthropologist Dan Lieberman said the skull is much more than a curiosity. He likened it to Raymond Dart's 1920s discovery of a skull of an "ape-man" in southern Africa, which lent the first support to Charles Darwin's theory that the deepest traces of human evolution could be found on that continent. "It's a major find," Lieberman said. "It will take many years for us to understand just how important it is." Other researchers were more guarded. "This is a great extension onto the fossil record," said University of California paleontologist Tim White. "But that's what the real story is  it's an opening window." The Toumai skull, with jaw fragments and several teeth, was found last July. Dated between 6 and 7 million years old, Toumai  of the newly dubbed species Sahelanthropus tchadensis  could be as much as 1 million years older than previously found hominid fossils, and at least 3 million years older than the next-oldest hominid skulls. Last year, a 3.5 million-year-old skull was identified in Kenya by Meave Leakey. 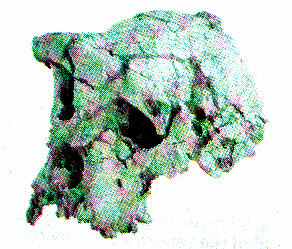 It was named Kenyanthropus platyops, or "flat-faced man of Kenya." That skull appeared to be roughly the same age as the most famous hominid specimen, nicknamed Lucy. The partial female skeleton the size of a small chimpanzee was discovered in Ethiopia in 1975. Declared to be a new species, Australopithecus afarensis, her skull suggests a transition from ape to human. Lucy also had ankle and foot features important to upright walking. "In its own way, this is more important than Lucy," Wood said of the Toumai specimen. Indeed, Toumai is prompting scientists to reconsider the story of human evolution in several ways. The specimen's age falls near a critical point when the human lineage split from the great apes. Relying on genetic evidence, scientists assumed the split occurred 5 to 7 million years ago; Toumai's appearance may push back the timeline. The find also challenges whether human ancestors evolved on the east side of the African Rift Valley, while apes evolved on the west. The isolated valley formed when a geologic fault collapsed 8 million years ago. The climate in the valley turned drier, and forests gave way to savanna. With few trees, scientists believe that pre-humans had no option but to walk upright to see over the native grasses. West of the valley, the landscape remained lush. Scientists believe apes remained in trees there and failed to evolve. "This new find is a wakeup call," Lieberman said. "We can't tell the whole story about human evolution just from fossils from one little sliver of the continent." In their report in Nature, the fossil-hunting team detailed Toumai's unique features. It appears to be the size of a modern common chimpanzee with a similar cranial capacity, but small teeth comparable to hominids'. "Its face is much more modern that of Australopithecus (Lucy) and that's what astonished me," Lieberman said. It lived in an Edenlike lakeside setting, lush with vegetation and animal life that included crocodiles, snakes and turtles, according to the discovery team. In February 2001, French researcher Brigitte Senut described a new hominid species found in Kenya that she dated to 6 million years old.